The Devil Queen: You Want a Piece of Me?! "Jack was joking about me posting pictures of the wallpaper on the blog and some eccentric home improvement millionaire wanting a sample of the pattern so they could make reproduction wallpapers for big money." So, you want a piece? That is cool with me, but there are a few caveats. Don’t worry, it’s nothing unreasonable. 1) This wallpaper is extremely brittle. I can’t guarantee what kind of shape it’ll be in once it arrives, but I’ll do my best. 2) If you are secretly running a business like Bradbury & Bradbury and use the pattern sample as a template for you new line of wallpaper, I want a percentage of the profits. No, seriously. 3) Build a shrine to the Devil Queen and worship her in all of her dark majesty. If you (Lisa Jo and Jocelyn) are interested, email me at thedevilqueen(at)hotmail(dot)com (there is a link if you go up to the top of the page and click “view full profile”) and tell me what pattern (ceiling, wall, or both) & how much of it you’d like. I’ll see what I can do for you. Jocelyn, I’m sorry to have to tell you this, but there is no turtle. I took a second look at the pictures from yesterday, and I can see that it does look like one. But, sadly it isn’t. Here is a better picture. The “turtle” is actually a bunch of palms. If that just ruins the whole thing for you, that is cool. If you still want some, let me know. Ha! It fooled me too. I was sure it was a turtle yesterday. Heck, it still looks like one. Either way, the paper is awesome! 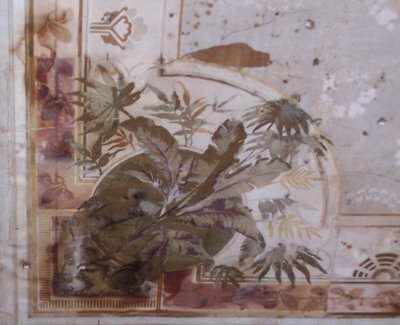 Some friends of mine, who have more money than they know what to do with, paid to have some wallpaper reproduce from a scrap they found in their house. They wouldn’t divulge the cost but they said it was expensive. Doesn’t Jocelyn work for a wallpaper manufacturer? Great wallpaper! It beats the junk in my house hands down.